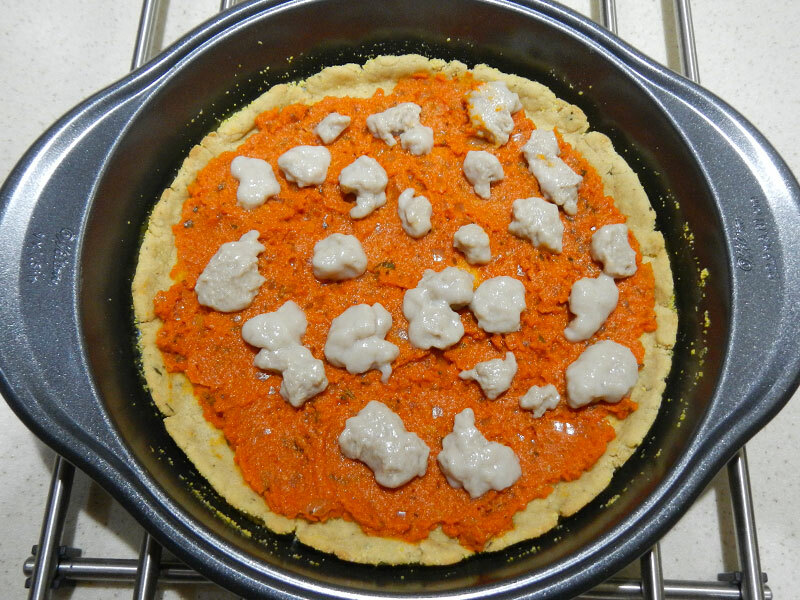 In keeping with my make-it-from-scratch theme for my pizza, I opted to make vegan mozzarella cheese from scratch. The book is “Artisan Vegan Cheese”, by Miyoko Schinner. 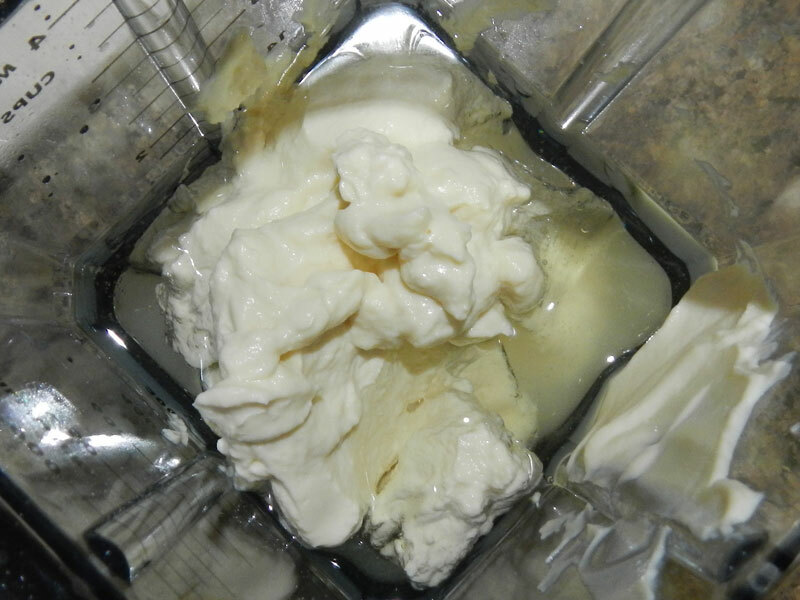 The recipe is on page 44, and it’s called “Meltable Mozzarella”. Note: Read the entire post before you try this at home! This cheese is made in two parts. 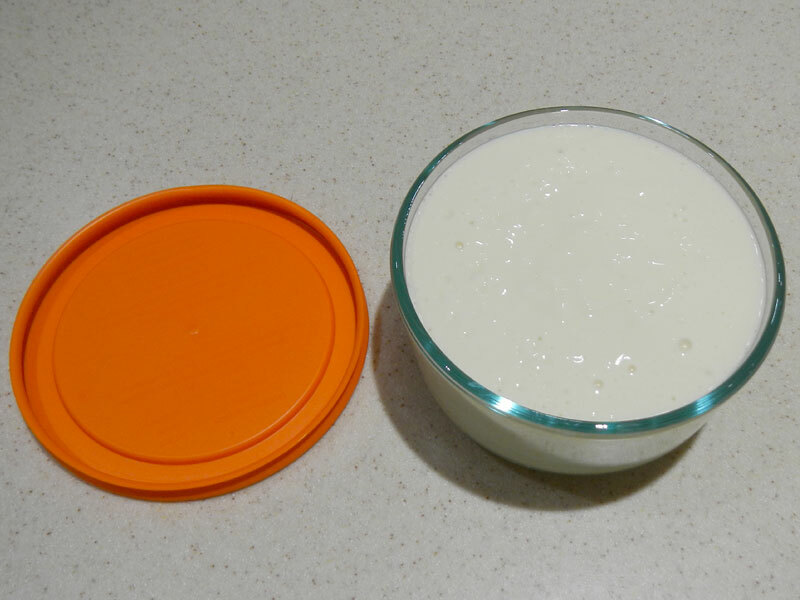 First you make a mixture of yogurt, oil and water, and allow it to “culture” at room temperature for up to 24 hours. Here’s my setup for the culture. Process until smooth and creamy. 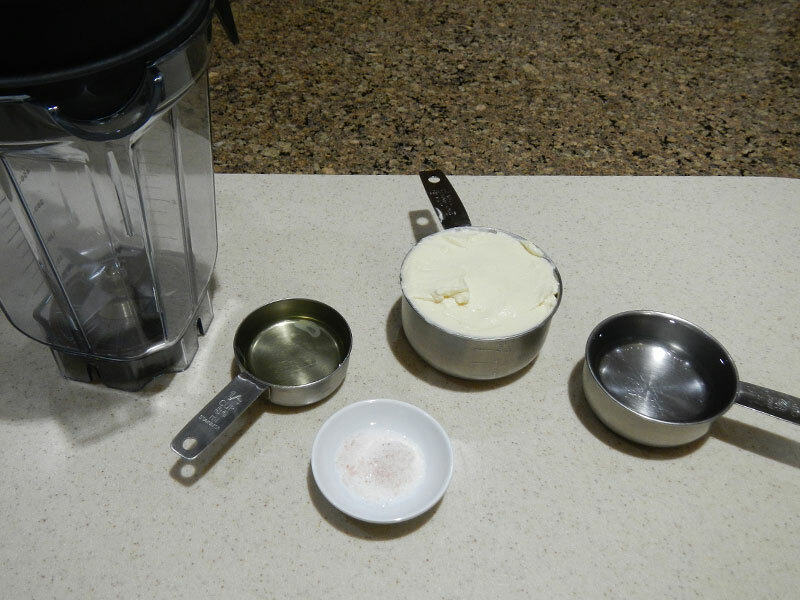 Stop and scrape the sides of the blender container as needed. Pour the culture into a clean glass bowl and cover. Leave on the counter at room temperature for 8 to 24 hours, until a mildly sharp flavor develops. When your culture is tangy to your taste, it’s time to make the actual cheese. Here’s my setup. 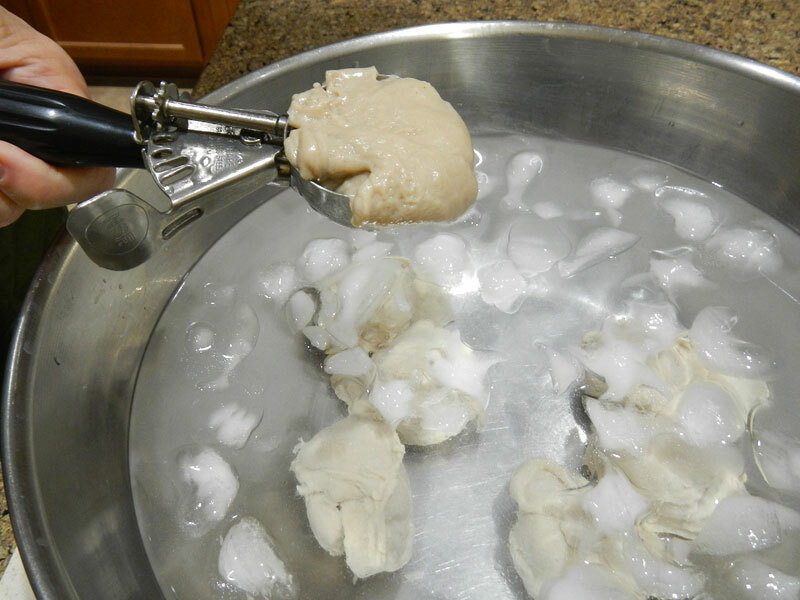 Make the brine by mixing the ice water with the salt in a large bowl. Stir until the salt dissolves. Set aside. 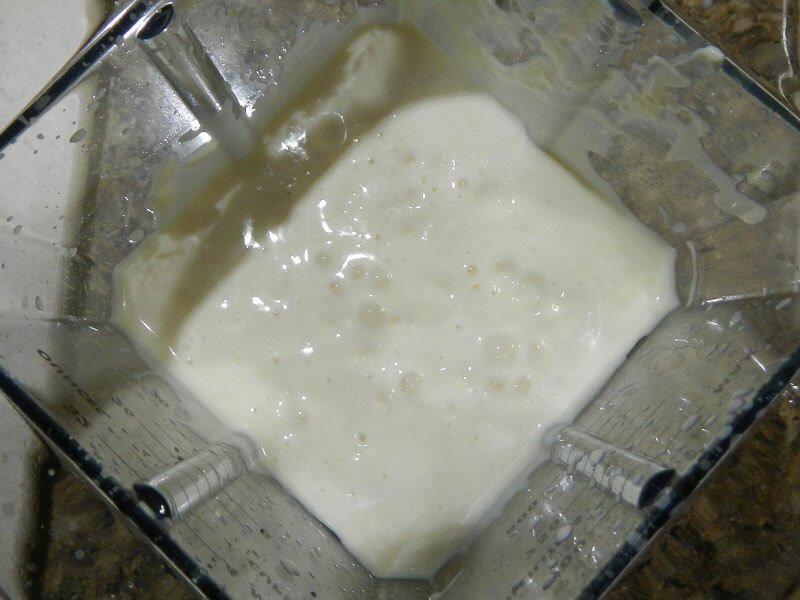 Put the cultured mixture into the sauce pan and whisk in the tapioca flour, carrageenan and xanthan gum. 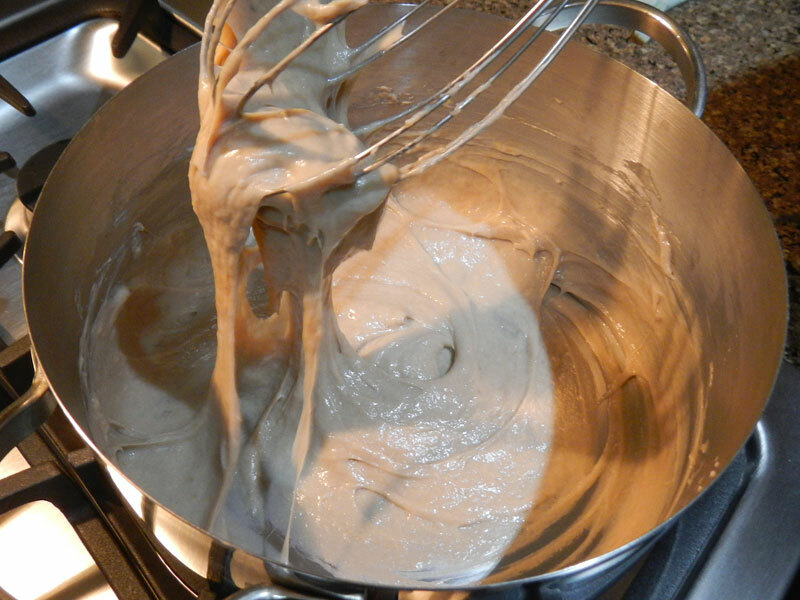 Cook the mixture over medium heat, whisking constantly, until it is very smooth, thick, gooey and glossy. This should take 3 to 5 minutes. 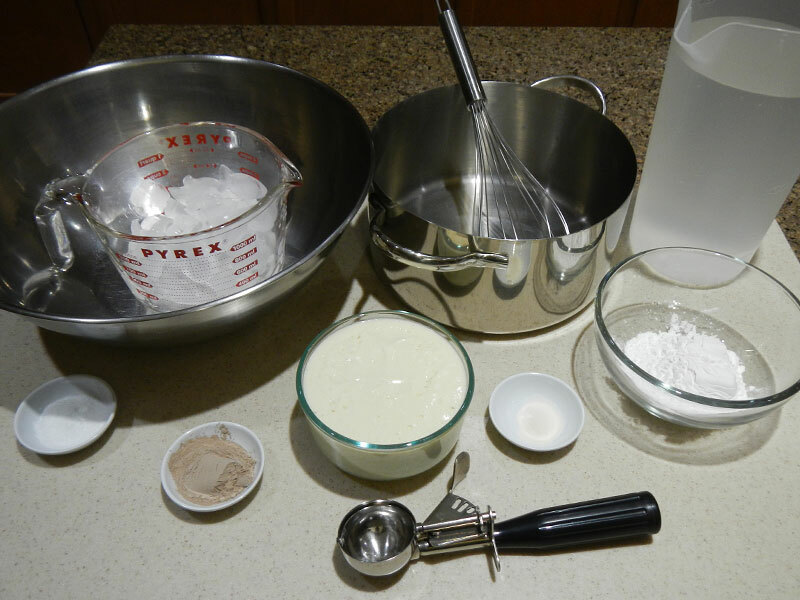 Use the ice cream scoop to form balls of the gooey mixture, dropping them into the brine as you go. They should harden as soon as they hit the iced brine. Storage: Store covered, in the brine. I didn’t have an ice cream scoop, so I used a cookie scoop. I recommend the bigger scoop. My balls of mozzarella look kind of weird, and I think it’s because the scoop was too small. My cheese came out a light tan color. I know that looks kinda weird. I am using raw Irish Moss (carrageenan) powder, and it is kind of a malty, brown color. Soy yogurt is a bit darker than other kinds. The two things, together, caused the darker color. I don’t really care what color it is, though, as long as it tastes good and works! I made this on Saturday morning, and used it Monday night. By then, it was getting a bit “mushy”. 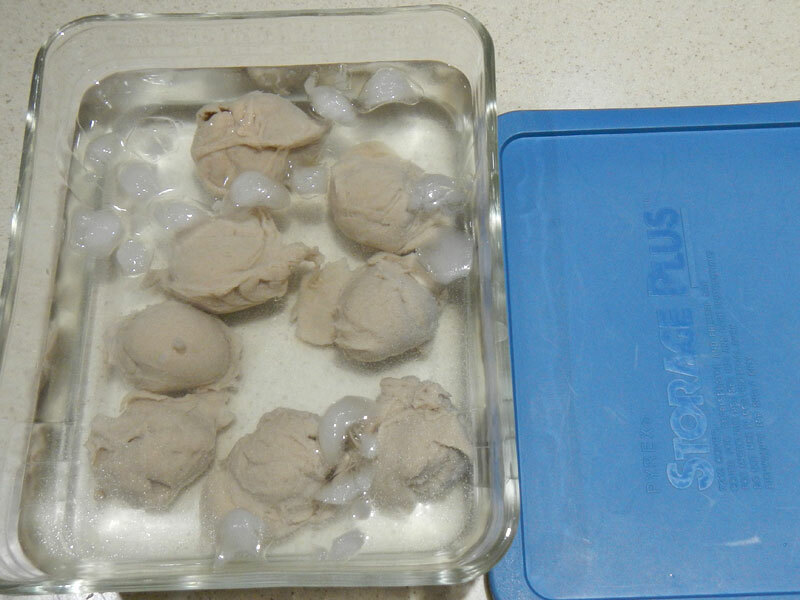 I think the problem was the tapioca flour in the yogurt dissolving out into the brine. The centers of the balls was just fine. I think next time, I will make my own yogurt (which is what I should have done in the first place!) I want to try this with hemp milk. I think it will work. Here it is on the pizzas before we baked them. It looks a bit weird, doesn’t it? It did cook up ok, it melted and was a bit stringy, but I wasn’t thrilled by it. If you look at the original pizza pic I posted on Monday, you’ll see that I also had SoyStation Mozzarella sprinkled on top. I bought it as a fall-back, in case this didn’t work at all. I’m glad I did. I’m going to try this again with some modifications. I’ll post an update when I do!